BEIJING, Jan. 16 (Xinhua) -- The leading Party members' group of the Chinese People's Political Consultation Conference (CPPCC) National Committee met Wednesday to study a recent speech made by Xi Jinping, general secretary of the Communist Party of China (CPC) Central Committee, on Party governance. 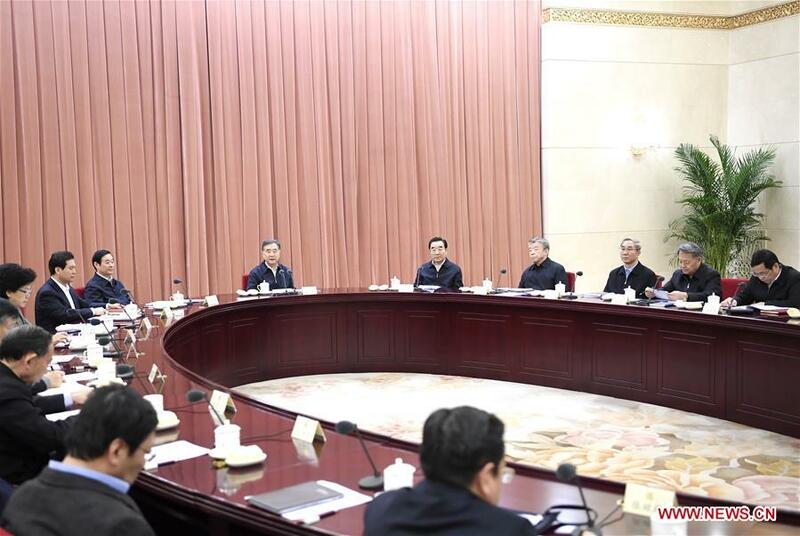 Wang Yang, a member of the Standing Committee of the Political Bureau of the CPC Central Committee and chairman of the CPPCC National Committee, presided over the meeting and delivered a speech, according to a statement issued after the meeting. Xi's speech at the third plenary session of the 19th Central Commission for Discipline Inspection of the CPC pointed out the general requirements and major tasks of the Party on the current and next stage, and showed once again the Party's will and determination to continuously improve its conduct and punish corruption, the statement said. Senior political advisors agreed that studying and following the spirit of Xi's speech should be taken as an important political task, to ensure that the CPC Central Committee's decisions and plans on improving the Party's working style and frugality and anti-graft battle are implemented. The leading Party members' group of the CPPCC National Committee should give full play to its significant role as the Party's united front organization, improve its guidance in ideological and political work, and unite a mighty force in pushing forward reform and opening-up as well as economic and social development, said the statement.